The Toronto Budget Committee has recommended funding new debt for the initiative to carry on. The revitalization of Regent Park has been lauded as a “game changer”—partly because of the project’s mixed-income integration model. But despite its flourishing amenities and the positive attention it has attracted, the community—long one of the poorest in Toronto—is far from immune to funding woes. A January 17 report from the City of Toronto’s Budget Committee indicates that the first two phases of the Toronto Community Housing Corporation plan for Regent Park have seen a significant funding shortfall. As a result, phase three of the project, which includes replacing 339 units of housing, is expected to have unfunded costs totalling $107.7 million. “According to TCHC, delays in timing of sales of market housing resulted in delays in the social housing redevelopment,” a portion of the report reads. The Budget Committee also cited “additional unexpected costs” associated with phases one and two of the project to have contributed to the funding shortfall. In order for phase three of the project to proceed, the Budget Committee has recommended that the City of Toronto authorize TCHC to incur indebtedness of $107.7 million. This measure reflects a larger problem in the TCHC. The deputy city manager’s Tenants First report, dated June 14 2016, called the TCHC’s business model “fundamentally broken,” with a growing operating deficit resulting from “a combination of static revenues and rapidly increasing operating costs.” The report also identifies numerous governance and organizational issues. The report makes five recommendations for the future of TCHC, including a transition to an independent non-profit structure and switching to the Rent-Geared-to-Income system. This shift would require changes to provincial legislation. According to Ana Bailao, city councillor (Ward 18, Davenport) and chair of the Affordable Housing Committee, the $107.7 million shortfall for the Regent Park project was expected. Bailao says that in addition to putting up funds for TCHC to incur the additional indebtedness to launch this project, the City increased TCHC’s operating budget by 15 per cent in 2017 and budgeted about $1 billion for repairs related to community housing. Laura Gallant, press secretary for Ontario Housing Minister Chris Ballard, said the Province has been supportive of the Regent Park revitalization project. “To date, in partnership with the federal government through affordable housing programs, Ontario has invested approximately $50.4 million to create 710 new affordable rental units in the Regent Park Revitalization,” she wrote in an email to Torontoist. But Bailao says the provincial and federal funds available to the City are limited. “That fund has been used in Regent Park and we’re thankful for that fund, but it was actually used to create additional affordable housing. It cannot be used to replace the rent geared to income units that were there,” she said. The Regent Park revitalization project is not the only one of its kind in the city. Alexandra Park and Lawrence Heights also have similar projects planned. 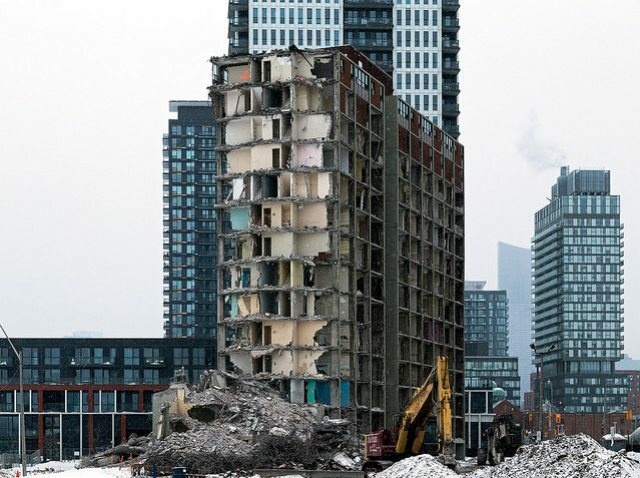 When asked about whether Torontonians should be concerned about the future prospects of these projects or later phases of the Regent Park project, Bailao said residents should expect all three levels of government to come together to deliver. She is optimistic about the upcoming National Housing Strategy in the works at the federal level, and Gallant said Minister Ballard is also looking forward to the strategy. “This is time that we get together, we rally, and we say to the other levels of government: show me the money,” Bailao said.